lian Ilaria Bonin. Bonin captured the record from Natalia just 7 months ago before the 51 year old Molchanova took it back. e beaten, but only temporarily. I’ve worked the past two years on earning the constant weight no fins world record, held now by Natalia. Not only do women like Bonin and myself have to earn the record but we have to maintain the record. For us it is a full time job trying to master just one discipline, answering back to Molchanova every time she decides to swab the deck with our efforts and reclaim a record. Hoping all along that she’ll have mercy and just break it by a meter. Giving us a ghost of a chance to get it back for a split second. and the language barrier add to the je ne sais quois** that is the Russian Monster. Ashley is co-owner and operator of Evolve Freediving as well as a 3x World Record holder and 12x US National Record holder in freediving. 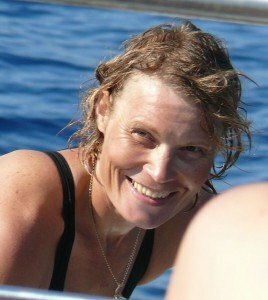 She lives with her husband Ren and 3-year-old Ani on their trimaran sailboat in North Carolina in the summer months and the Caribbean in the winter.